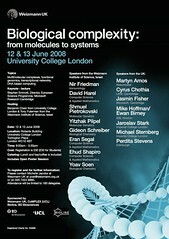 Details of two-day conference titled “Biological Complexity: From Molecules to Systems” at University College London (UCL) in June 2008 have recently been announced. Speakers and topics are described in the link above and also by Martyn Amos on his blog. Speakers from the UK include: Martyn Amos, Cyrus Chothia, Jasmin Fisher, Mike Hoffman / Ewan Birney, Jaroslav Stark, Michael Sternberg and Perdita Stevens.